Rooms with sea and garden views in the heart of Guethary. 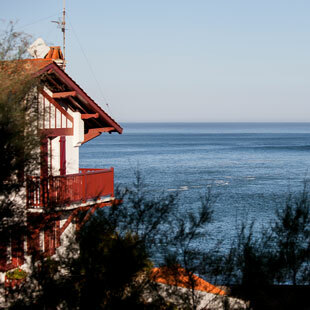 On a hill overlooking the ocean, in the heart of a small Basque village, the former school saw generations of children fill its classrooms for over 100 years. One day, the school became quiet as all of its students were transferred to a brand new, larger school. A family from the village decided to instil a different life into this beautiful stone and brick building that stands high and with great allure in Guethary. The result is a simple and beautiful hotel, bathing in natural light, a haven of peace open to everyone, all year round. Spacious guest rooms have replaced the classrooms and a flower garden has invaded the playground. 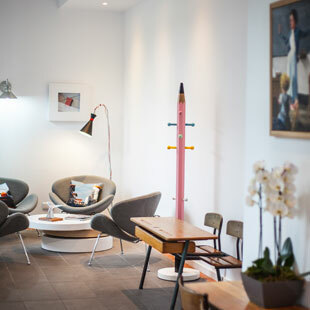 The spirit of the former school is still present: the mural painting, a huge blackboard, beautiful old maps and children’s drawings remind guests of the hotel’s past existence. The hotel’s name, Balea (whale in Basque), is courtesy of artist Killy Beall’s mosaic that adorns the south wall. An emblem that dates back several centuries ago when Guethary used to be a whaling port. The whales are long gone, but they’ve left their silhouette on the village's coat of arms.